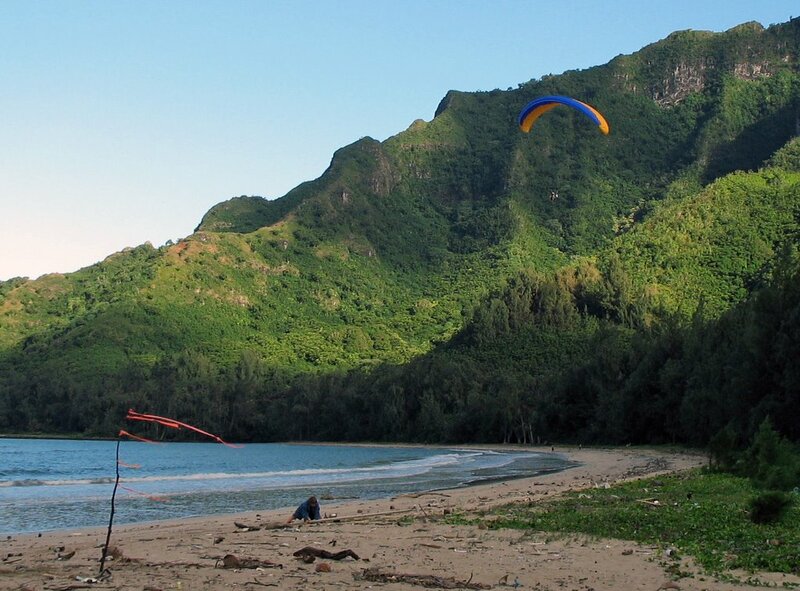 Don and Marathon spent the afternoon in a heroic struggle to launch into the super cross conditions at the north ridge at Kahana, but it was just too cross from the NNW and they never made it off. 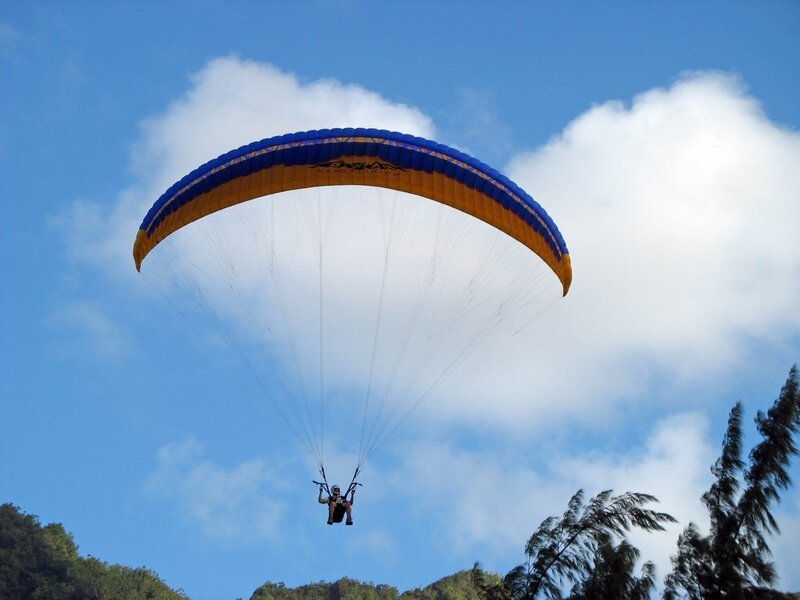 Meanwhile Doug arrived and hiked up Anti-Kahana with a friend who wanted to try a tandem flight. Just as I arrived, on my way home with the kids after school, Doug was laying out to launch into what looked like a very northerly flow up there, straight towards the gap of the Crouching Lion. As Don and Marathon watched from the north ridge, and I looked on from the beach, we were soon rewarded with a surprising and unprecedented spectacle. We saw Doug inflate the wing, and I thought it was kind of strange that I could clearly see someone standing by the wing, but I figured there must be a third person up there. Then the glider lumbered up into the sky, and right away it started taking all kinds of asymmetric and frontal collapses. That was bad enough, but about that time it was becoming clear that Doug had no passenger. His silhouette was too small, and the glider was recovering very slowly from the whacks, as if it were barely loaded. The glider was still going up like a hot air balloon, but it was sort of lurching around in the turbulent air. Finally Doug rises out of the trashy air, and his passenger gets on the radio and tells us that Doug had just been trying to flake out the glider to prepare for launching when he was picked up like the Wizard of Oz. Doug's passenger wondered if Doug might be coming back to get him, but it didn't really look likely to us, especially considering how nasty the air was near the launch ridge. Doug soared the trees a bit and then brought that empty jumbo jet in for a nice slow landing. Too bad his friend didn't have any ruby slippers - he could have avoided the hike down. After saying I wasn't going to steal Doug's thunder I realized I had some nice pictures to share so I went ahead and stole it after all. Sorry Doug, maybe you can regale the guys with the exciting details tomorrow night. That's an Oopps I guess!!! !